This one really came down to the wire, but Dave pulled through like a champ and colored artwork that I was still tweaking at 9 PM tonight. With page 8, the first chapter of the Reboot to the Head saga comes to a close, and beginning in a couple of weeks we’ll be starting the next leg of the storyline, which moves beyond Phinn’s solo storyline. Before I go on, I’d like everyone to do me a favor. Click on that link, the one that heads on over to the Reboot to the Head page, where you can see large thumbnails of every page in the series so far. They are listed in reverse order, so please take a few seconds to scroll up and down once or twice to take them all in. 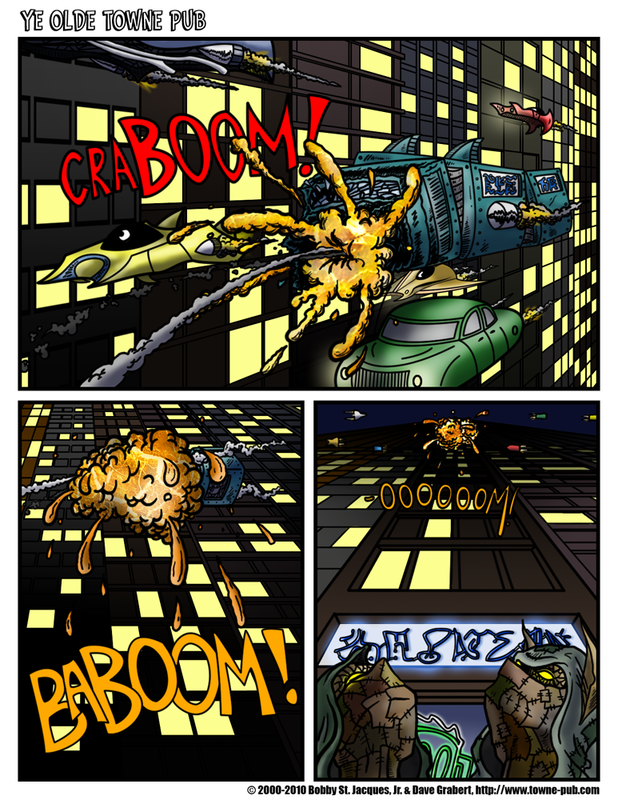 Dave and I posted 8 full sized, full color comic pages over 7 weeks. Looking at them all end-to-end there I can’t help but very proud. I still think that these are some of the best strips Dave and I have ever done. I hope that you agree. As I mentioned last week, and earlier in this very post, today’s page wraps up Phinn’s solo chapter. Next week we’ll continue with chapter 2, which picks up with another beloved character in the Towne Pub cast. Well, beloved by me, anyway. I’m really looking forward to switching gears, but I’ve done absolutely zero prep work beyond writing the script, so I’ll be taking some extra time over the next week to build up some art assets (character designs, rough sketches, environments, etc), and Dave will be using the assets to experiment with color palettes. I expect the first page to be posted two weeks from today (March 5th), after which our weekly update schedule will continue for the duration of chapter 2. If I fall behind for any reason, I’ll make sure to let everyone know. I think Dave will be doing a Tuesday update this coming week, and it’s a fun one that features some behind the scenes detail from the last two pages Phinn’s chapter. I hope you’ll stop by to check it out. I’m also planning on posting some original artwork next Friday to give people something to look at. So please bear with us for the brief delay! As always, we loves the comments. They look great Bobby ! !